This lecture is presented by author Mary Ellen Hannibal who is a Bay Area writer and editor focusing on science and culture. She is a regular contributor to LIVESTRONG magazine; her writing has also appeared in the San Francisco Chronicle, Esquire, Elle and Yoga Journal magazines among many other publications. 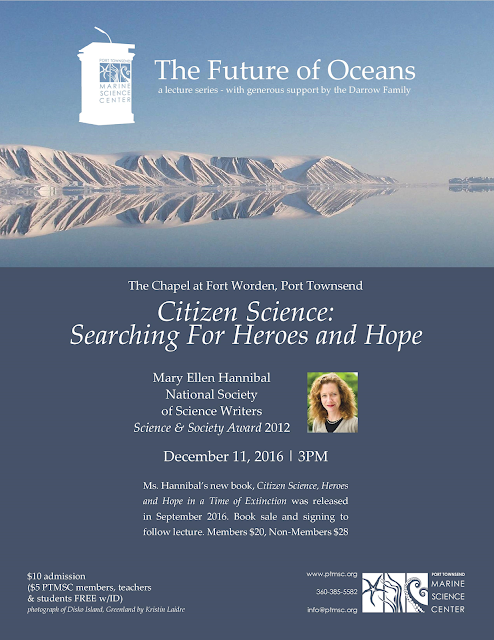 Ms. Hannibal's new book, Citizen Science, Heroes and Hope in a Time of Extinction was released in September 2016. Book sale and signing to follow lecture. Books will be $20 for PTMSC members, $28 for non members. I heard Mary Ellen Hannibal in an hourlong interview on the radio, and she was fascinating! I'm so pleased PTMSC is bringing her here. This should be a great evening. "Why are the Crabs Dirty?"